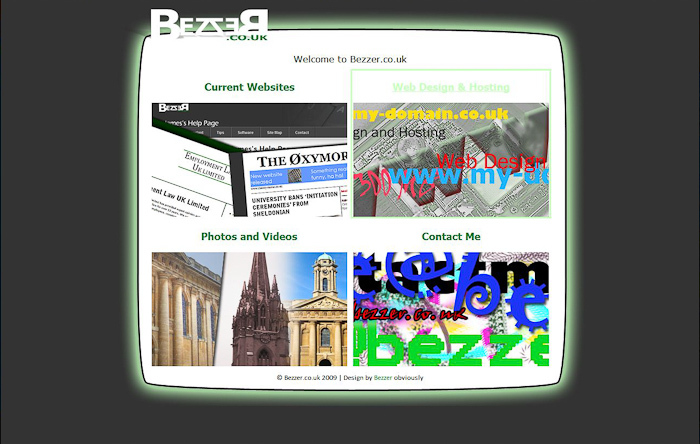 These version numbers are not totally accurate... bezzer.co.uk has been online since 1st June 2000 and had many different faces even before version 1. However these are very old and are stored on 'many computers ago'... lost in a digital recycle bin probably. These are the latest five major versions that I still have in complete working order on my computer (technically version 5 doesn't work on my computer due to it's requirement for server technologies like MySQL and PHP). Online at the end of 2009. 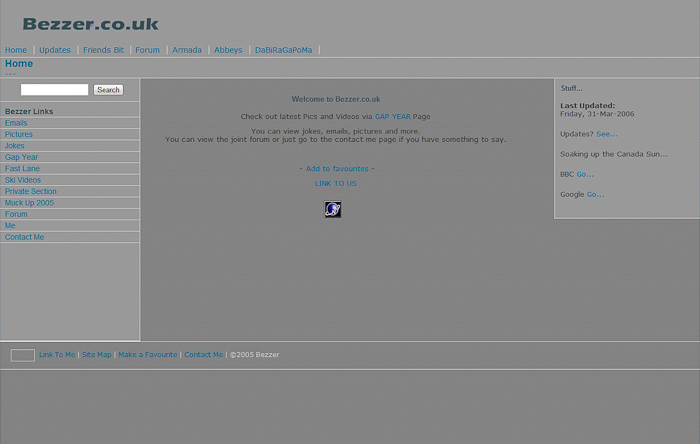 This is what the site looked like when I was using Joomla. Worked fine but because of the scale of sites Joomla is usually used for it always felt a little empty. You'll notice the brilliant headers are still in use, although I will be cutting the worst and adding some new ones to version 6. Tech: Joomla CMS with a custom template. This was live mid-late 2009. My focus then was to try and get hosting business as I had shifted hosting package to a reseller account and had space to fill (still do). The site felt very clean and very very small. Was only really a problem when I wanted to update things as everything was static and the pretty border/background didn't allow much flexibility on size. Tech: Pure 100% HTML and CSS. All validated. Online around August 2007. I was going for the clean look... #fail. 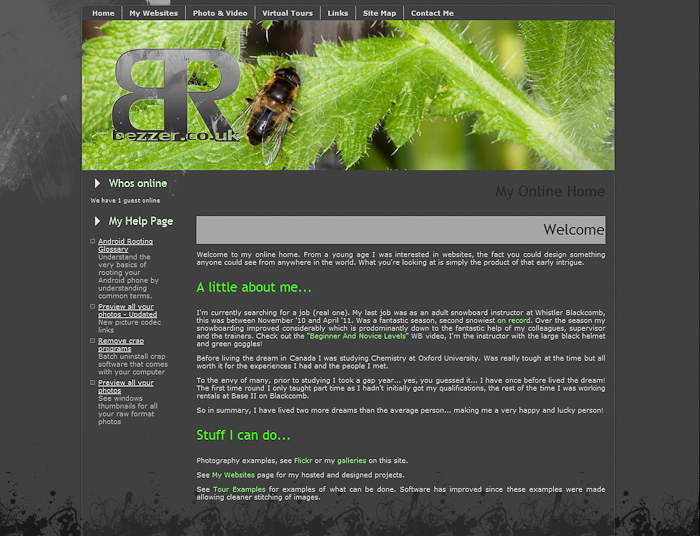 The white on black bit worked fine but the tight green border and cheap feeling flash menu cluttered the page. This was live most of the time I was at university. Tech: Flash menu and iframe construction for the pages. HTML was clean and simple. Online around April 2005. Probably the cleanest of the previous looks. Was a graphic overhaul from version 1 but actually the content was exactly the same, think of it more of a template change with extra menu items as time progressed. Tech: HTML and CSS using Dreamweaver's template functionality for quick manipulation of the whole site. Not going to make any claim as to it's validity! On an up side, I did invent Twitter! Or at least I had a list of updates which were usually no longer than a single line (around 140 characters or so) and they were in effect my boring micro-blog, see below. Although the content referred to is now unavailable, the string of short boring updates was clearly a muse for the founders of Twitter :-P.
Well so much for the new matrix film! Well 2 more terrorist of countryside pics! Loads of new emails since last update. New video. General updates in pics and emails. I found your blog on yahoo. I think it’s awesome.